How to Make Your Business Accessible Without Violating Rights of Others | McKee-Horrigan Inc. Catering to persons with disabilities is a necessary task for today’s business owner. And it is also tricky. On one hand, the law has placed strict requirements on businesses to provide entrances and exits that allow those with special needs to come and go with ease. On the flip side, there are also laws put in place that can make the installation of such equipment complicated. In other words, some of those features may not be allowed at all, when they’re really needed. Accessibility is a crucial aspect of building tasks, such as commercial renovations, but it is one that needs careful consideration and planning if you are to avoid ethical and legal drama. Naturally, it’s normal for most people to agree that the personal well-being of your customers comes first. After all, they are the lifeblood of your business, and it makes absolute sense for you to cater to their needs. It’s astounding how many office spaces and storefronts lack the features needed to keep persons with disabilities safe and comfortable. From a lack of access ramps to automatic doors, you may be surprised at the number of businesses near you that ignored the needs of those with disabilities. These owners may not realize how detrimental this can be for their business, and it’s unfortunate since the consequences are so obvious! Remember this: It is your responsibility as a business owner to cater to those facing physical and mental challenges. Failing to do so may not only result in the loss of valued customers, but you may face guilt and harsh criticism from people who recognize your lack of support for such people. But complications arise when access ramps and other accessibility tools get in the way of city bylaws and legal codes. It’s easy to assume that the law will support every move made to facilitate persons with disabilities, but that isn’t always true. And there are many instances where a business may have to eliminate an accessibility feature (although not permanently) in order to avoid legal drama. Signs, a Toronto restaurant catered to the hearing-impaired, faced the issue of having a city complaint compromise its accessibility. The restaurant’s founder and owner, 29 year-old Anjan Manikumar, wanted to created an eatery that was accessible in many ways. However, his efforts to install a ramp were met by a notice of violation two weeks later. Frustrated by the notice, Manikumar installed his own temporary ramp, citing his belief that he wouldn’t need a permit if the ramp wasn’t permanent. However, the City of Toronto ordered Manikumar to remove the ramp since it posed a safety hazard to pedestrians and individuals with visual disabilities. There is a strict policy regarding the level of encroachment a ramp can have on city property (in this case, pedestrian sidewalks). City sidewalks must provide at least 2.1 metres of width for pedestrians to tread, and busy streets such as Yonge Street where the Signs restaurant is located (Yonge and Wellesley) may need more. Currently, the ramp that Manikumar installed extends to about 72 centimetres onto city property, leaving the sidewalk a mere two centimetres short of the 2.1 metre requirement. Manikumar can make an application allow this encroachment, but it will take a special application and substantial proof that he has no other choice. You feel a strong sense of sympathy for Manikumar and his customers, hoping that he’s able to keep the ramp. Regardless of the outcome, this story highlights the fact that even the best intentions can lead to legal dilemmas if certain protocols go unrecognized or unfollowed. If you are a business owner, it’s important that you think about city bylaws, and how they may affect your attempts to make your business more accessible. Ultimately, you must a find a way to achieve a balance between the two extremes of law and personal ethics. The solutions aren’t always readily apparent, and there can be a great deal of stress if the issue is time-sensitive. Learn property law – Speaking to a lawyer or legal consultant in the realm of property law can help prevent a lot of trouble down the road. Understanding city regulations can help you determine if a particular accessibility feature will attract scrutiny or not. Revisit the core values of your business – On the flip side, you need to think about the core values of your business. Are you inserting a feature merely to please a certain demographic, or are you genuinely doing so to cater to their needs? Questions such as these will help you figure out whether your accessibility device (i.e. ramp) belongs at your place of business. Plan accordingly – Generally, going through these two steps will make it clear if you should proceed with the installation of a particular feature or not. The solution may not be one you’re willing to accept at first, but it could lead you into the direction of other options. 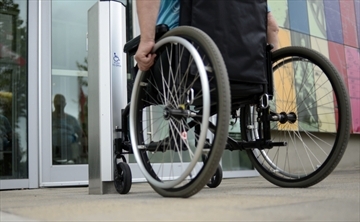 It’s possible to have a facility that’s both accessible and legally fit – an office space or storefront that meets legal requirements without putting disabled persons at a disservice. With that said, it’s a tricky feat to pull off, but it can be done. What you need to do beforehand, is to carefully examine the nature of your business, its physical location, and the potential scenarios that may lead to complaints from the law or your customers. Yes, balance is key. However, your efforts to consider all angles when planning your commercial renovations will make it easier for you to meet the various standards placed upon you. Working with the right team of people will make this possible. Are you looking to install new access ramps for your business place? Contact us so we can help you get started!